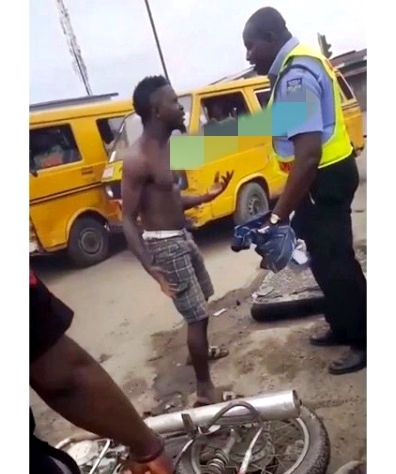 The dramatic moment in which a commercial motorcyclist, also known as Okada, engaged in a fight with a Nigerian police force officer in the commercial city of Lagos, was captured on camera. 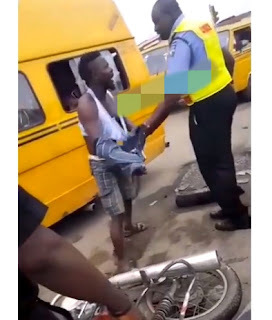 The incident, which was recorded by a local resident, reportedly occurred early today in the Isolo area of Lagos, while witnesses say the fight was as a result of the bike man's refusal to pay the N200 bribe. The identity of the Okada pilot or the Police that participated in the fight was not verified by TORI News as at the time of the presentation of this report.